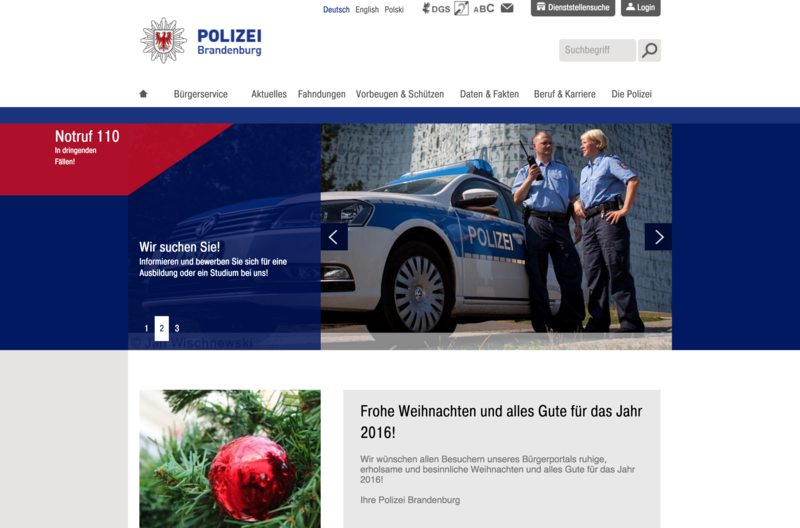 In 2011, the IDL // Interaction Design Lab was commissioned to guide the state police of Brandenburg through the redesign process of their online communication portal. The project started with the initial usability studies of the existing portal, continued with an analysis of their target audiences and resulted in the redesign of the corporate design – including an overhaul of the logo, typography and color palette. All efforts are integrated in the final redesign of the overall web portal. The new portal provides citizen with more convenient ways of getting in touch with the police. From getting a permit for a demonstration to reporting your stolen bike or car, all interaction and communication needs can be met with one unified interface. The new website is accessible from mobile devices, tablets as well as desktop devices, providing citizens with all the information they need, wherever and whenever they need them. Beyond the website, we collaborated with Raureif to create a mobile application for Android and iOS.